Time flies when you are having fun! It’s true! 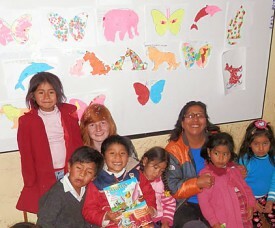 Six weeks of Spanish classes in Peru have flown by. At the end of July I arrived in Cusco for the first time. Impressed by the amazing views, the altitude, and the number of people I had to get used to this new city. Now, weeks later, it has become a genuine home to me. I got to know so many people; my classmates, my Spanish professors, the people working at AMAUTA Spanish School and even random people in the streets of Cusco. I got to know where to find cheap places to eat out, I learned which shops will try to rip me off and therefor to avoid. 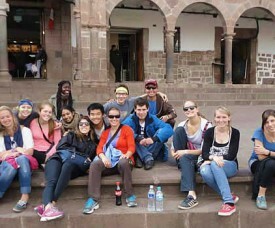 I experienced Cusco’s nightlife, the events happening at Plaza de Armas at an almost daily base, but most of all I learned the Spanish language! Last week I took an exam. Above the exam was written nivel avanzado (advanced level). I was proud to read that I apparently have an advanced level of Spanish. For years I doubted to take Spanish classes. I once took an 8 class course at home. Not much came out of that. Now years later, I decided to really go for it. 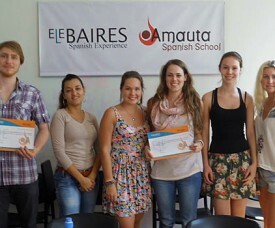 I started following at AMAUTA Spanish School. Four hours every day. Now, 120 hours of classes later, I learned all the grammatical rules. Of course my Spanish is not perfect yet. I need to work on my vocabulary and practice a lot more with all the Spanish grammar. But at least I know what the rules are. Arriving in Buenos Aires as a Spanish student you might feel a bit lost and overwhelmed by this big city. Of course the AMAUTA Student Service Coordinator can help you out. No question is crazy enough for our staff in Argentina. 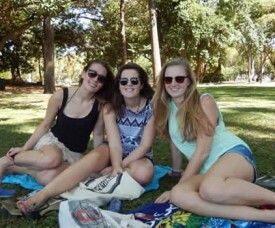 Also the host mum of your host family can tell you more about the ins and outs of Buenos Aires. Or, if you are not living with a host family but in the student residence in Buenos Aires, your fellow students are always willing to answer your questions. Getting prepared also involves a lot of reading about Buenos Aires. This link: http://www.dosmanosargentina.com/travelargentina/travel-tips/ Once ready to get your volunteer project or Spanish classes in Buenos Aires started and explore the city on your own, there are a number of apps that will help you making your stay in Buenos Aires as pleasant as possible. This application shows how you can move from a to b with every possible way of transportation: train, bus, subway, car, bicycle and walking. Recommended! This is an application that will guide you through Buenos Aires. You will find restaurants, attractions, hotels and more in this app. A great thing about this app is that it can also be used offline. It shows exactly where you are and if you are close to a good restaurant for instance. 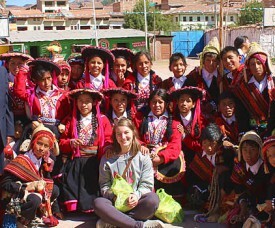 AMAUTA Spanish School and its volunteers in Peru had the opportunity to take part in an anniversary celebration with one of our volunteer projects in Cusco. It was a big event with lots of typical dance, great Peruvian food, and wonderful people. The AMAUTA volunteers were treated as special guest and allowed to sit in some of the best seats. This project – a school – loves its volunteers as they help out in various areas, such as, physical education, art, English, and math. The volunteers also enjoyed watching the dances up-close and learned from this new cultural experience. After signing up for your Spanish lessons in Buenos Aires it is time to start preparing your trip to Argentina. This is half the fun! Here are 5 usefull tips about how to best prepare your stay in the beautiful city of Buenos Aires. 1. Did you think you already knew quite some Spanish? Think again! Argentine Spanish is a bit different. The ‘sh’, ‘ll’ and ‘y’ are pronounced as ‘sh’ in “shop”. So instead of saying “yo me llamo” (my name is), Argentinans will say: Sho me shamo. It will be written the same though.